It’s time to say goodbye to those flimsy and tiring mice. This 3200 DPI optical mouse provides you with crisp quick response and smooth operation. The unique contour shape fits snug to your right hand, bringing you incredible comfort! No more afraid of long time working or gaming! You can simply click the CPI switch button to adjust the speed of your mouse freely. The default DPI value is 1000 and the DPI level can be changed from 1000 to1600/2400/3200, which corresponds to different LED indicators colors from red to blue, green and purple. 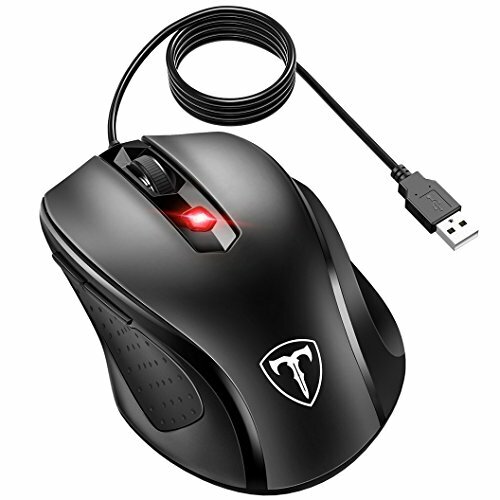 The wired optical mouse supports plug and play, no drivers needed.